Here's one of the cards I made from taking the one below apart. I'm much happier with how this one turned out! Al the information is the same except for the image, which I switched out for one of the three little cuties in Mo's set "Tea for Three". I also added some tiny pearls around the image and used paper-piecing on her dress. 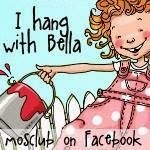 Bling is the theme for Mo's Challenge this week! I always have a problem with challenges that call for bling! I love glitter and shine on other people's cards, but never seem to be able to pull it off myself. This card gave me trouble from the very start! Nothing went the way I envisioned, and I couldn't get it to look any better. I wished I'd moved the image a little to the right for better balance. I'm actually taking this whole thing apart and making two cards out of it. 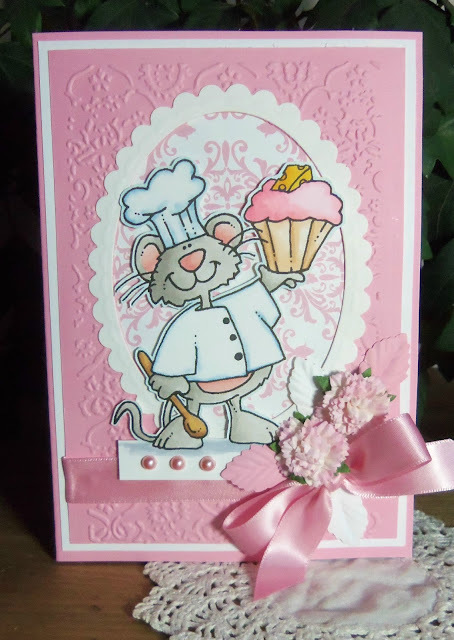 I'll be using a different, smaller image with less colors on this card and using this image on a background with less frill. Here's a picture that shows I did use some glitter! Images: "Catching Up" (full version) from Mo's Digital Pencil, Stamped greeting from SU! 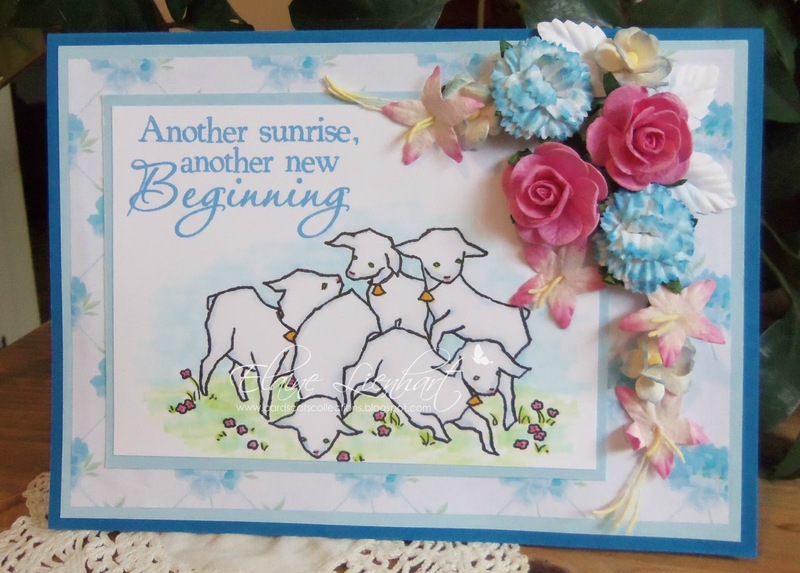 This card uses the image "Lambs Playing" from A Day For Daisies. 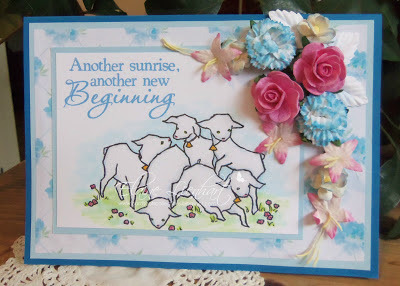 Aren't these little lambs the sweetest?! I think the digital sentiment is perfect for this card which I'll be using for Easter. The flowers are from WOC, and the pretty digital paper is from Jak Heath. I love this mouse! He's adorable and so easy to color! That's all for today! Don't forget to join us for Mo's Challenge! I think you revamped that card beautifully although it was already pretty. The shimmer on the flowers is really pretty. Lovely Elaine. :-) Hugs! I love both cards, Elaine! They are too cute and the way you used the background paper is very clever. 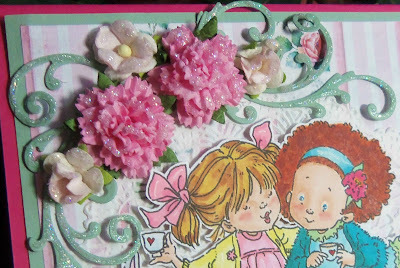 It just looks like wallpaper!And the soft glitter on the flowers is absolutely beautiful! Wow I just love both of these cards. Awesome!! 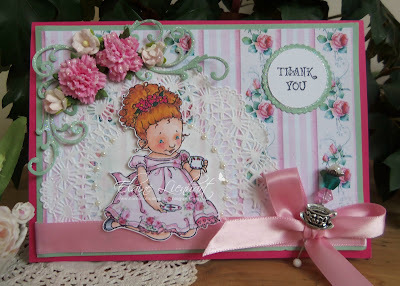 You do awesome "Bling" cards! !